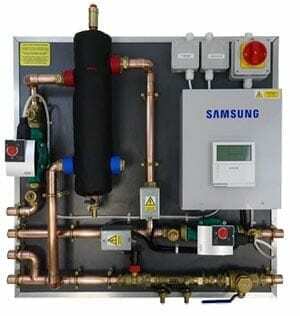 Samsung EHS systems just got even easier to install. Why waste time on site when you can fit the Fast-Connect Board. The board includes everything you need to make your next installation fast, efficient and easy. Pre-commissioned by our award winning engineers, all you need to do is choose your cylinder and make a few easy pre-prepared water and power connections. All settings are pre-programmed to suit your installation (with unlimited heating zones) and an easy to follow installation manual is provided. The board is light enough to be installed by one man and on a standard installation, an experienced engineer will be able to have a system up and running in just one full day. We know you can do everything on this board yourself, but when we make it this easy, why bother? Note: The Fast-Connect board comes in one size: 850W x 830L x 205D. Please make sure there is sufficient room on the wall for it along with 100mm of clearance for servicing. Important ! ALL warranties now need to be registered with Samsung! Since its founding in Suwon, Korea in 1969, Samsung Electronics has grown into a global information technology leader, managing more than 200 subsidiaries around the world. The company’s offerings include home appliances such as TVs, monitors, refrigerators, and washing machines as well as key mobile telecommunications products like smartphones and tablets. The company offer EHS Monobloc Heat pumps. Their range is the culmination of years of research in to what an Air Source Heat Pump should be. Simple to install, configure and most importantly use, the EHS Monobloc is the most cost effective solution to the majority of domestic heating needs. Join our ZERO Home Bills Community. The Best Air Source Heat Pumps from the BEST Heat Pump Brands at the BEST Retail Prices available in your market on ZEROhomebills.com by Solaranna.